Photo’s of other peoples bikes on the internet have helped me with this project. Maybe these will help someone else. As the restoration is ongoing I will occasionally update with more photo’s. Since starting the work on my R11 last year I have had lots to learn. The forums past items have proved useful along with direct answers to my questions. I do have some engineering and fabrication experience having started a small business in 1983 manufacturing vintage and classic car body units, hood frame folding mechanisms, and other items to supply various restoration companies. I let the business go in 1995 so probably a little rusty in some areas. Things have moved on, processes and products have moved standards higher, but it has been good to meet old contacts again from this period to help sort some of the work. I no longer have the workshop facilities that I had, and grateful for their help. I took detailed photo’s before and during stripping it down. I started by blasting all the cycle parts and replacing sections of the mudguards. The frame was good, but the fork suspension tube had stress fractures around the spring mounting. I made a new one of these using the original spring mounting and bottom lugs. I assembled the bike parts in primer to check alignment. This was done by using approx 4ft long bar to act as a long rear axle, and similar threaded bar at the front held by nuts and cone washers. I could line the “axles” up side on and horizontally with each other. A small tweak on one spring tube lug, then drilled, pinned and brazed. (I don’t know if this is the recognized way to align the bike) Then checked again with rebuilt wheels using straight edges, and wheel alignment checked with mudguards etc. It was stripped again and sent for painting. The primer washed off and light blasting before paint process began. I am expecting the first parts back from the painter at the end of the month. The tank has been treated with an ethanol proof lining. On stripping the engine I found it had been rebuilt as stated with valves, re-bore and new pistons, cam and followers surfaced etc but the crank had a tight spot on one big end. This has also been rebuilt with new bearings throughout. The crank and cylinder barrels also carry the matching engine number. The mag/dyno has needed a new dynamo armature and have re-wound the magneto. The gearbox has new bearings, and seals replaced with modern types. Rear drive has new bearings and seals, the gears are good but new drive shaft and kardon drum is to be fitted. Start of the strip down, head removed as it certainly didn't look rebuilt from the outside. At last some painted bits. Engine now test run, first impression carburation is good! I asked the painter for some photo's at various stages... I got 341! After the run, speedo indicated 150km covered. Winner of the Feridax Concourse Trophy. Submitted by guest on Fri, 07/13/2012 - 19:52. As a BMW WWII bike fan I congrat you for this amazing bike and also piece of history. I look forward for another pictures from restoring and I hope I ll find my own project as yours. I ve already search this kind of bikes all around Europe and they are really hard to find. You re a lucky guy. Submitted by guest on Sat, 09/29/2012 - 13:46. Wow...this is most amazing indeed! What a piece of history saved. Any recent photos? I have yet to buy my first vintage BMW but it is going to happen. Submitted by guest on Sun, 01/06/2013 - 01:03. You have outdone yourself, and the engineers that designed and built it would be very proud..Great Job!!!! Submitted by guest on Thu, 02/14/2013 - 01:37. You have certainly done an excellent job!! Enjoyed all your pictures !! my bike was originally imported into Australia about 1933 with Steib sidecar,personal transport of Melbourne motorcycle dealer.He died about 1942,bike was sold about 1950,brought over to Tasmania,had some repairs carried out but due to unavailability of bits no more work done. It is fairly complete,Bosch light and horn,aluminium pistons ,runningboards,carryrack,wrong throttle,missing hornbutton(courtesy of platers,) and missing speedo. still no mufflers, I had it running for a very short time with open headers!! This R62 may be the only one in Australia. Submitted by guest on Tue, 02/19/2013 - 19:44. Sir,Just purchased a 1964 BMW , found it in an ole timers garage covered in blankets. No nothing about BMW,s ,allways a Harley guy. Need parts badly. Frame ,tires,wheels ,drivetrain original.Frontend ,gas tank , seat ,who knows , but definitly not BMW. Where can I possibly find parts for this bike? Can you help me? Russell klemm , popklemm@yahoo.com , 727-374-5850 thanks. Submitted by guest on Thu, 02/28/2013 - 17:19. I appreciate all the comments received, I am very pleased with the result. At this moment (Feb 13) I am waiting for registration doc's so I can start to ride it, and hope it will ride as well as it looks. Hank, you need to get on with that bike! Many of the parts are readily available now, certainly the parts you mention, and with your Dollar strong against the Euro they should be a bargain. Tasmania is a stunning place, wish I had known about the bike when I was there. I wish you the best of luck and hope you can sort it. Submitted by guest on Fri, 05/16/2014 - 08:01. Hi. Actually I was looking for a pair of Cast Iron cylinders for 1928-1929 BMW R62. The one I have right now is in a terrible shape. I really doubt if a welder could repair at least one of them. Submitted by guest on Fri, 07/25/2014 - 07:05. Hi, my name is Grzegorz and I'm from Poland. I have BMW62 from 1928. I start restoration my BMW, but I have a big problem with find foto and size of kickstand, because my one kickstand was corroded. Thanks very much and of coures GRATE JOB with yours projekt!!!!!!!!!!! Submitted by Albertus on Mon, 04/27/2015 - 10:48. That's some fine restoration work on that vintage, Ian. Amazing transformation! Your build is being featured in the BikeBuilds.net directory here: Ian R11's R62 Build. Submitted by BuildFan on Mon, 03/07/2016 - 22:50. BuildFan here from BuildThreads, Inc.
Congrats and nice work, Ian R11 - this build thread was chosen as a Best Build Thread pick for this week. What this means is that a bunch of guys who like to build stuff (cars, trucks, 4x4s, bikes, cabins, boats, planes, garages), and have read a ton of build threads, thought that this build thread makes a valuable contribution to online DIY culture. 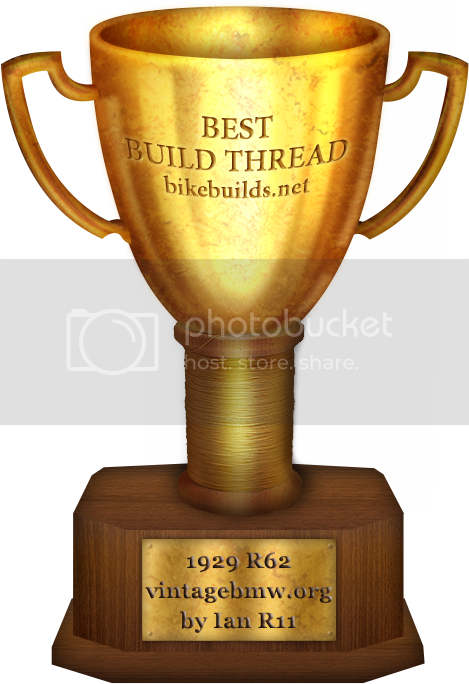 If you like build threads, you can see all our winners here: All Build Thread Trophy Winners. We also have 8 different builds listed from Vintage BMW Club on our BikeBuilds.net build site, fully credited to all builders and to Vintage BMW Club. Hope we've been able to send you guys some good visitors. And we give away our 50 Must Read Homemade Tools ebook for free to all winners and their forum. You can grab it at the link below. Congrats again and cheers!